Mary Mattingly is an Eyebeam Alum who was in residence in 2011. 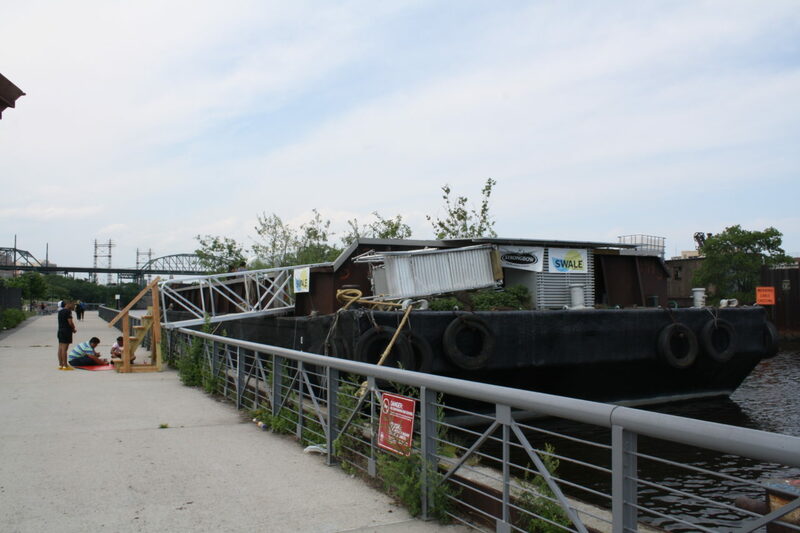 A barge is not typically a place associated with greenery or landscaping. With her work Swale, though, artist and Mary Mattingly dramatically reconsiders what a barge can be. In Swale, a barge becomes a space with unique access to the commons of the water, where restrictions placed on the use of public land no longer apply. Instead of acting as a means of transporting goods, a barge becomes a public resource where food can be grown and harvested by anyone who needs to do so. Beyond Swale, Mattingly’s work continually questions notions of sustainability and land use, and focuses on migration and nomadic living. Her pieces have included an Arctic Food Forest, a floating mixed-use space in Philadelphia, and a reimagined bridge, among other projects. Eyebeam was able to catch up with Mattingly about her current practice in the following interview. Eyebeam: Your main project at Eyebeam, Flock House, explored questions of how one can inhabit space and what it means for space to be public or private. Generally, how have you seen your work evolve since your time with Eyebeam? 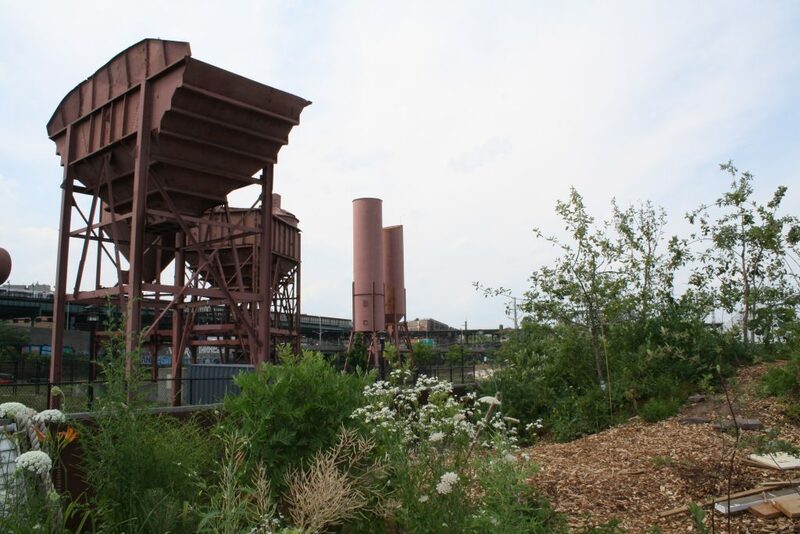 Mary Mattingly: In 2012, the Flock House Project involved three microspheres that inhabited sites in the five boroughs, from public parks to parking lots to rooftops. It was an investigation into liminal spaces with materials from developers’ waste streams, specifically because those materials already met building code. Flock Houses were platforms and stages for artist and architect-led projects that focused broadly on different forms of engagement. Flock House questioned whether public art could facilitate intimate experiences while also expanding a public commons. For me personally, it was an experiment in ascetic living that led me to make life changes. The physical labor involved in moving giant spheres around to different locations every few weeks prepared me to bundle almost all of my belongings into large boulders that I tethered to myself and pulled through the city. The lack of possessions that could accompany a Flock House left me with such an acute awareness of objects I might usually take for granted, that I undertook an intense study of the supply chains surrounding every object I bundled. Eyebeam: Your recent work Swale seems to build off the questions of public space and sustainable living that you explored during your time atEyebeam. Could you explain the background of the work? 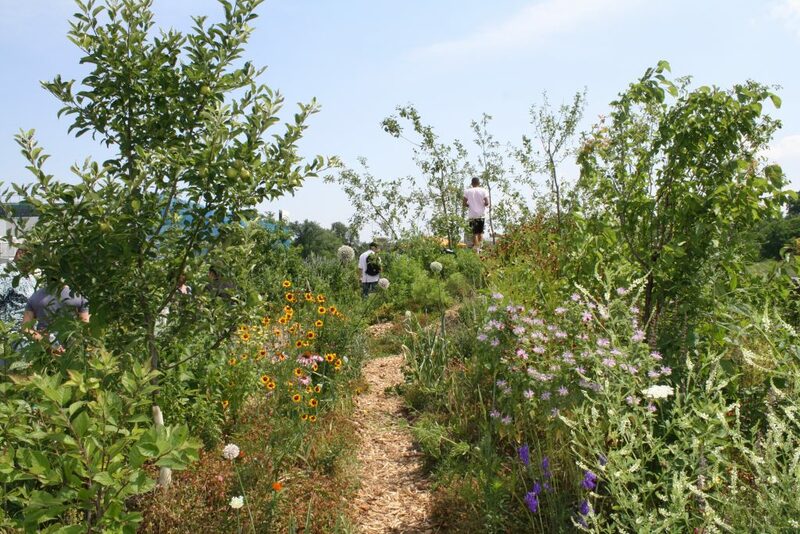 MM: New York City currently has 100 acres of community garden space, compared to 30,000 acres of public parkland. Growing or picking food in New York City’s public land has been off-limits for almost a century for fear that a glut of foragers may destroy an ecosystem. 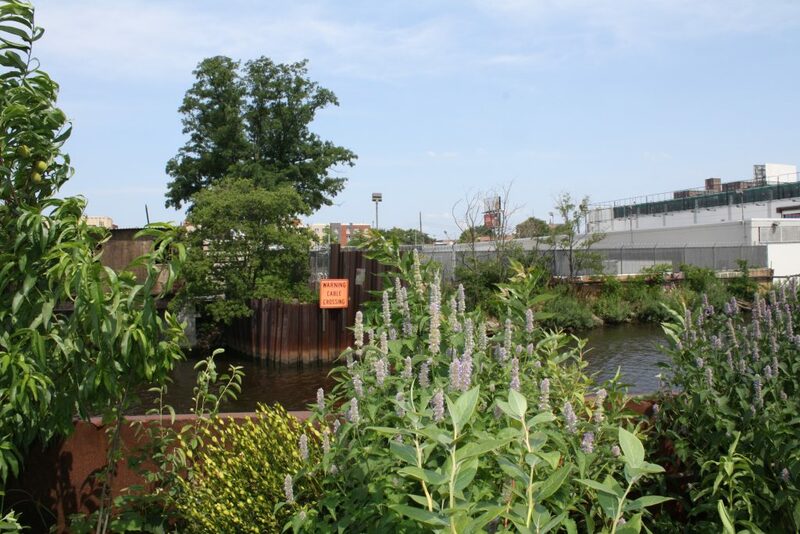 Swale is a public floating food forest in New York – it utilizes common laws of the water in order to circumvent public land laws here. This way, Swale is able to dock adjacent to public land and allow people to freely forage edible and medicinal plants grown onboard. All of these projects build off of each other. Swale came indirectly out of a project called Waterpod. It was a self-sufficient living system, also on a barge. That project took a large amount of face-to-face research to learn about local laws, so I became aware of how the waterways that surround New York City are governed, and that really they are the closest space New York City has to a true commons. With Swale we are utilizing one commons, the water, to support another, food. I’ve been inspired by Vandana Shiva and Elinor Ostrom who assert that the commons can be sustainably managed where people trust each other, and work together in caring for a place. We don’t place a limit to foraging on Swale. That said, when Swale launched in 2016 at its first location and there was not much ripe to pick, on some days we found more people bringing plants than taking them. With a focus on long-term stewardship, Swale is an artwork and platform that exists between policy and the built environment to instigate a change in public land laws. Eyebeam: Similarly, what do you want your work to teach those who interact with it? What should those who visit Swale come away with? MM: While I want Swale to be a proposal for land-based changes in New York, it is a co-educational space as well, but without proclaiming to teach. I hope that people experience Swale and come away with a stronger conviction that like water, healthy food should also be a human right. That together we can change rules surrounding public space when we can show that there are enough active stewards and people searching for something else. Eyebeam: Your more architectural works such as Swale and WetLand definitely suggest an image of a utopian future. Given current environmental realities, and events such as the United States’ withdrawal from the Paris Agreement, how do you see these utopian and environmental works interacting with a diverse public that seems to not want to listen? MM: In 2016 when Swale was about to launch, I met with a group of people from the National Forest Service who had initiated a nationwide strategy to help reinforce initiatives that were building urban food forests. They did this because they know that diversifying food systems is necessary for food resiliency. I believe we are at a time in this country when we need to co-create more than ever, in order to move away from an each-person-for-herself mentality that is fortified through a ubiquitous marketing culture we can’t escape. By continuing to reimagine the public sphere, I believe art can enhance a larger movement that challenges the power dynamics between corporate food production, deregulation, privatization, and a widening inequality that is directly connected to social and food justice. It can strengthen collaborative ways of working together, being together, and supporting each other. Honestly, I’m better at bridging through compromise (that I believe can lead to incremental change) than arguing with people who aren’t ready to believe global warming is real, or that food insecurity is real. I think we can make incremental change happen by being actively on the offensive with our work, and to me that means in part not wasting time trying to change everyone’s minds but instead working to form coalitions. Eyebeam: Perhaps in other, more general words, how do you see art interacting with environmentalism? MM: Art as a system, re-evaluates things. It is necessary that in places like the United States the natural environment, built environment, extracted materials, and objects are re-evaluated. Art is particularly important to environmentalism in this regard. MM: I’m continuing to focus on and make work about different aspects of material supply chains. Also, Swale has a strong team behind it and we are considering forming a nonprofit. More information about Mary Mattingly’s work can be found on her website. Swale is currently docked at Concrete Plant Park in the Bronx. It is free and open to the public 1 -7PM, Monday through Friday, until the end of August. Article by Communications Intern Colin Lodewick. All photos were taken at Concrete Plant Park by Colin Lodewick.